Wouldn’t it be wonderful to have daily skin care treatments the way celebrities do? Well, with the help of bespoke skincare products, you can give yourself at-home facials that will keep you looking radiant between visits to your favorite clinic or medi spa. The key is consulting your aesthetician, who can recommend the best products and treatments based on your particular skin condition. At-home facials aren’t a new idea. Department store counters and pharmacy shelves are filled to overflowing with all kinds of products. The problem is that these skincare products generally fall into one of three categories: dry skin, oily skin, and combination skin. You want your skin to be as smooth, supple, and soft as possible. You have extra-sensitive skin that requires advanced care. You have special concerns – acne, freckles, ageing skin, discoloration – and want products that are engineered to maximise results. You want potent, targeted products that deliver optimal, long-lasting benefits. Cleanse – The first step towards healthy skin is cleansing it of dirt, oil, and chemical build-up. This makes it easier for the other products you use to penetrate your skin. dermaviduals offers a variety of cleansing formulations including DMS Cleansing Milk. It is suitable for all skin types and an absolute must for anyone with dry, dehydrated, or sensitive skin, as well as anyone suffering from eczema, rosacea, or dermatitis. Exfoliate – Exfoliating your skin on a regular basis will rejuvenate your skin and improve the benefits of your skin care routine. When you refine the top layer of dry, dead skin cells, your skin will regain its lustre and shine. You can reduce the appearance of large pores, clear acne breakouts, and improve your skin texture with the dermaviduals Peeling Cream. Using a circular motion, simply massage in a ten cent-sized dollop onto your skin to slough away dull cells. It’s really important not to overdo this though! Tone – Liquid tonics (or toners) close your pores and remove any traces of dirt or oil that your cleanser may have missed. dermaviduals toners are formulated with ingredients that help you achieve your most desired results – age-defying or acne-fighting, for example. Corrective face tonic is spritzed and applied directly to the face. Mask – Most dermaviduals Vitamin Cream Mask contains vitamins A, C, E and provitamin B5, together with DMS components and essential fatty acids. The formulation supports intensive skin recovery. The mask should be applied in a thick layer onto the face, neck and décolletage. Leave it to soak in, ideally overnight. Moisturise – All skin needs moisture to prevent premature signs of ageing, cell damage and the loss of beneficial nutrients. dermaviduals moisturisers help keep your skin glowing and vibrant throughout the day. The fact that we can deliver these cells the nutrition they are crying out for, without anything foreign like fragrance and colours makes all the difference. Eye Serum/Eye Cream/Eye Gel –The skin around your eyes is especially sensitive and needs an extra measure of TLC. 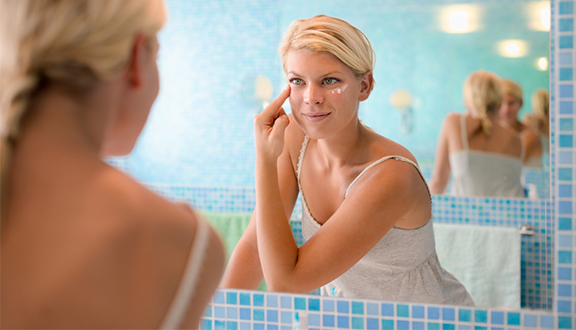 Complete your at-home mask with a dermaviduals eye serum, eye cream, or gel. Your dermaviduals aesthetic expert is waiting to give you the tools and the know-how to keep yourself beautiful.